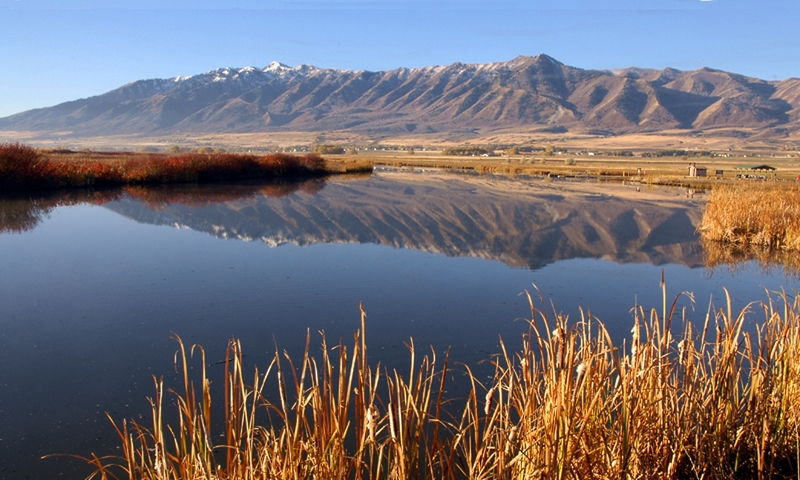 Now that spring finally seems to be arriving here in Utah, marshes, ponds, and other wetlands have sprung to life. It’s impossible to walk by a wetland without seeing countless birds rushing about collecting nest material, feeding, or advertising and defending territories. 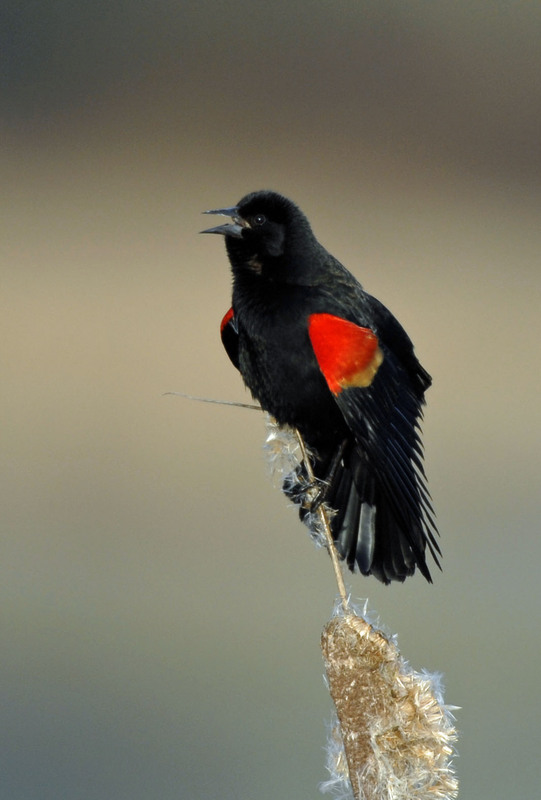 Two birds most commonly seen and heard in Utah’s wetlands are the red-winged blackbird [Red-winged Blackbird call, © Kevin Colver]and yellow-headed blackbird[Yellow-headed Blackbird call, © Kevin Colver]. As their names suggest, both are black birds a little smaller in size than a robin. The red winged blackbird has a red shoulder with a yellow bar below, and the yellow-headed blackbird has a bright yellow head. Both the red-winged and yellow-headed blackbirds eat the same foods, which primarily include insects during the summer, and seeds at other times of the year. They also both prefer to nest in stands of cattails, bulrush, or other wetland plants emerging from standing water. So, how is it that two very similar species of birds can coexist with the same habitat preferences? Well, competition and exclusion might be better descriptions than coexistence. 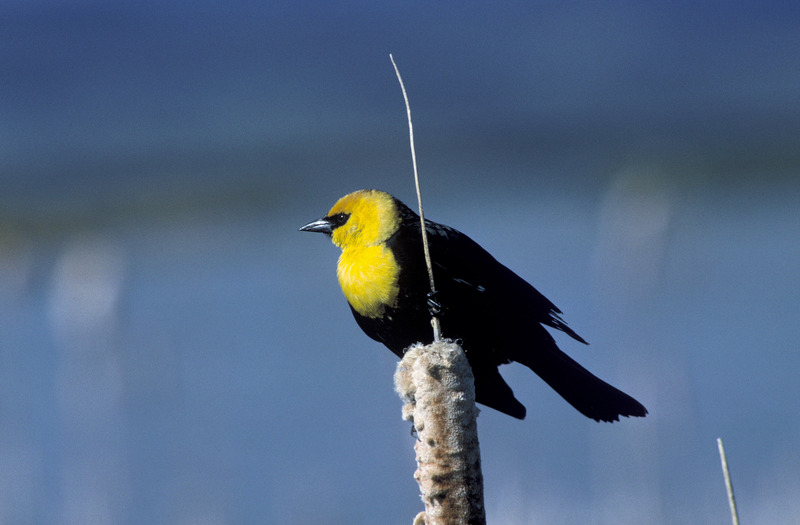 While the red-winged blackbird can successfully nest in a variety of habitats near wetlands, the yellow-headed blackbird specializes in nesting in the emergent wetland plants. This could be a disadvantage for the yellow-headed blackbird if it wasn’t for the fact that it typically nests in groups, or colonies, and are better able to defend a territory from intrusion by the more solitary nesting red-winged blackbird. So, in wetlands where only red-winged blackbirds occur, they are able to nest in the preferred habitat. But, when yellow-headed blackbirds are present, they force the red-wings to nest in less suitable habitat, even in tall trees far away. 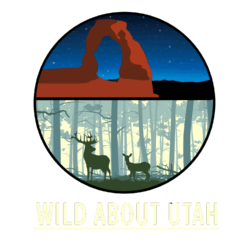 While red-winged blackbirds can often be seen year-round in Utah, the yellow-headed blackbird is usually only here for the summer breeding season. So, think of it as if we were red-winged blackbirds and our distant, out-of-state cousins came to visit for the summer. They get the most comfortable beds in the house, and they eat all of our favorite foods. But, come the end of summer, they head back south, and we can enjoy our homes to ourselves. To see photos of the two blackbirds mentioned in this program, please visit wildaboututah.org. Miller, R. S. 1968. Conditions of Competition Between Redwings and Yellowheaded Blackbirds. Journal of Animal Ecology, Vol. 37, No. 1 (Feb., 1968), pp. 43-62. Minock, M. E., and Watson, J. R. Red-Winged and Yellow-Headed Blackbird Nesting Habitat in a Wisconsin Marsh. Journal of Field Ornithology, Vol. 54, No. 3 (Summer, 1983), pp. 324-326.